The final crackdown of police forces and their move into Gezi Park on Saturday (15th June) might not have rendered the protests complete, but it has left the Gezi Protests without its central symbol, its centre of action. Along with this development, we have seen an evolution in the way people are using their right to protest democratically. One such move has been spawned by Erdem Gündüz, the performance artists who stood silently in front of Atatürk Cultural Centre in Taksim for 8 hours straight. 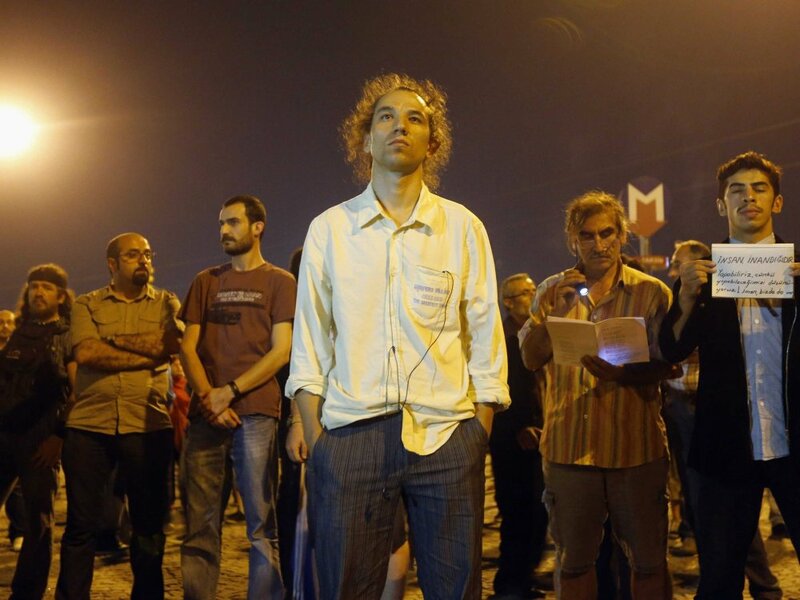 Erdem Gündüz, a performance artist, came to Taksim Square and stood silently in protest. In solidarity, others have adopted his approach.. I suppose most of you will have heard of ‘the standing man’ protester. He stood on the 17th June, 4 days later the movement has gone viral and is still going strong in central locations across Turkey’s provinces. I personally find the silent protests especially fitting for the following reason. The response of Erdogan and his cabinet on the Gezi Protests has been dismissive from the get-go. The AKP has bent backwards to paint a picture of the protests which scapegoat the protesters as ‘marginals’, ‘vandals’, ‘terrorists’and ‘drunks’ who have been used by foreign conspirators aided by the CHP (main opposition party). The AKP as a party line and Recep Tayyip Erdoğan in person has been pointing fingers at the domestic opposition (party politics wise) and the international bodies (organisations in specific like CNN, The Economist or international communities like the EU) without acknowledging any criticism against their own management over society as a political body. The best democratic way of reiterating this public frustration is captured in silence: ‘nothing left to be said’. As benign as protesting silently is, it is still a protest and thus the government feels threatened by it.